Since letting go of my old Nursery to concentrate on garden design I have had to really wrestle with my propagation compulsions. But a recent water bill plus a bout of random and regular trips away has made care and watering of plants in pots a real issue - despite my many water butts and irrigation system. 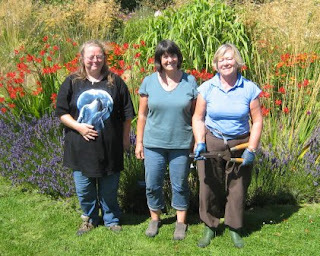 One of the Gardening Girls, Paula on the left, has a new garden! A complete blank canvas and she needs plants - lots! As Paula was the 'Propagation Queen' at the Nursery it seemed only fitting that she should be the recipient of this clear out as she probably had her mitts on most of these plants at some stage in their life. I swear to God that she only had to gaze at a packet of seeds for them to germinate in-situ! Remembering her blowing 'Golden Virginia' roll-up smoke over some restio seeds from Kirstenbosch Botanic Gardens makes me laugh still! The sorting process became cathartic. Not only was I having a clean sweep, getting to grips with my 'life laundry' - whatever that means - I was also reminiscing about the various stages in my plant growing life. In just the same way that old photos trigger memories, I found that certain plants did exactly the same. Restio tetraphyllus - the south african trip with the GGs. Wildflower plugs left over from a wonderful pond planting for a client - note to self don't give up on your wildlife pond dream! Carex ' Yellow Tails' with a number RS. Don't forget to call in and visit Ray Brown from Plant World seeds on next trip to West country. I need to give him feed back about his Sakhalin Island seeds plus catch up on our mutual friend in Morocco. I didn't even know where Sakhalin island was until I met Ray - do you? Finally safely delivered into the loving hands of Paula, who does that happy clappy thing with her hands like Pingu when pleased. I'm not sure who is happier? So despite the season's demands I can recommend it - go on have a clear out! As I was saying when we met last time ... - those were the days! Happy memories. If there are any Beth Chatto geraniums left, I'd be very happy to have them! Cilla @ Elephants Eyelash - they are yours me dear! Plus a few other treasures destined for the 'life laundry'.